Pleased that for my 200th post I can share that I am excited to have my Peru Series of linocut prints in this exhibition ‘Purveyors of Print’ at Xylonite Arts, 12 Winchester Road, London E4 9LN from 08 April to 09 May 2015. 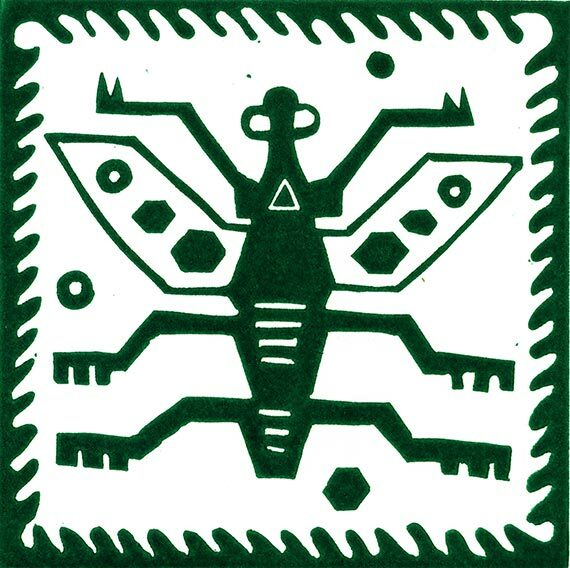 At last my Peru Bug linocut has dried, and I have editioned them and they are now available for sale via Etsy & Folksy. Sometimes I think I should give water based inks a go; but when I have used them in the past I just don’t quite like the look of them compared to oil based inks. I love using oil based inks, I know they aren’t as environmentally friendly and there is the issue of drying time. If any of you can recommend some water based relief ink brands, that you think highly of, I will definitely try some of them out. 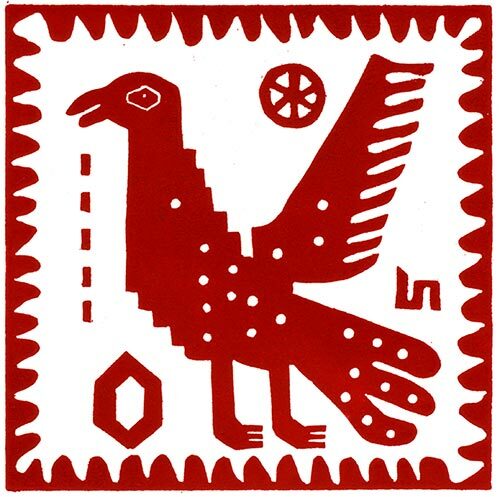 Finally printed ‘Peru Standing Bird’ linocut; part of my Peru Print Series. Printed in red oil based ink on Zerkall 210g paper. I am not going to add any hand colouring with ink, as I like the boldness of the image as it is. Here they are drying after printing. Hello, I have been hand colouring my pomegranate ‘Alhambra IV’ and ‘Peru Flying Bird’ linocut prints. Here are some pictures of them hanging to dry. In case you’re wondering I hang them via magnets on my metal shelves; a great space-saving idea for anyone with little room to work in. Why hand colour prints? Why not print all the colours? My answer is that I always use any technique to get the desired result. I like the way that drawing ink sinks into the paper whereas the oil based printing ink sits slightly on the paper. The oil based printing ink is printed densely whereas the drawing ink has some translucency, I like the visual contrast. Unfortunately you cannot see this subtlety of surface in these photograph. Also I like the way that each print is even more slightly different, as well as the print impression being varied – the way the colouring is applied differs slightly too. 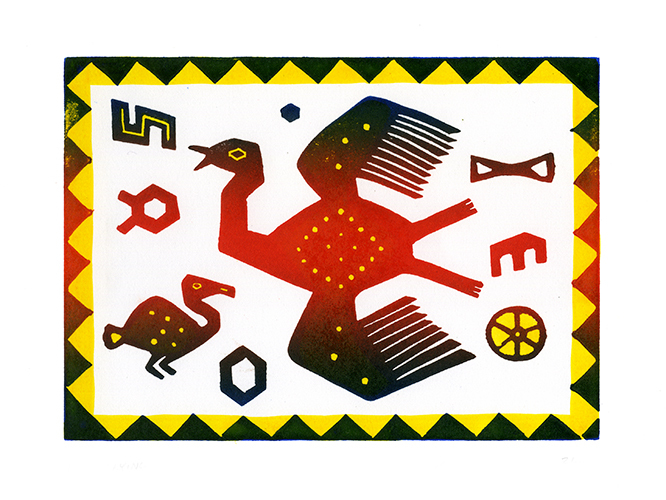 Yesterday I was printing my ‘Peru Flying Bird’ linocut which is an accompanying print to my ‘Peru Big Cat’; both inspired by the designs and symbols on a Peruvian textile that I bought in the USA years ago. As you can see I have used a multiple colour roll method for inking up, where you roll more than one colour onto the roller. In this case an orange stripe in the middle with blue either side. I have encountered some difficulty with this method, where the blue ink soon bleeds into the orange ink too much, resulting in the pure orange stripe becoming narrower the more times you apply the ink to your lino. The only satisfactory way I have solved this is by starting afresh with new ink after 10 prints, so not the most efficient method. Perhaps other printmakers out there have some advice on this issue? I am pleased with the resulting prints; but will probably hand ink half the edition of this print as I have already done with ‘Peru Big Cat’. I like the way that drawing ink sinks into the paper whereas the oil based printing ink sits slightly on the paper, I like the visual contrast. 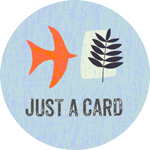 I have just participated in my first ever Print Day In May; a great global event that brings together printmakers worldwide to print on the first saturday in May. Even though I was printing home alone, it was lovely to think that I was part of this worldwide event and in fact was keeping very good company. 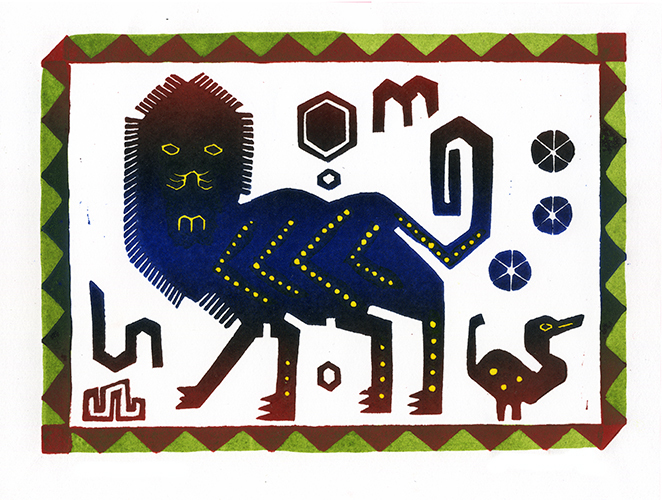 I have just finished printing my linocut ‘Peru Big Cat’ inspired by the designs and symbols on a Peruvian textile that I bought in the USA years ago.